Here is how far I've come with my 50 books for 2015. Yellow highlights mean I've read it already! 20. A book at the bottom of your to-read list. 25. A book you were supposed to read in school but didn't. David Sedaris is funny. David Sedaris reading his own stuff is laugh-out-loud, hey-Dan-listen-to-this-part funny. I really wanted to like this book more than I did. 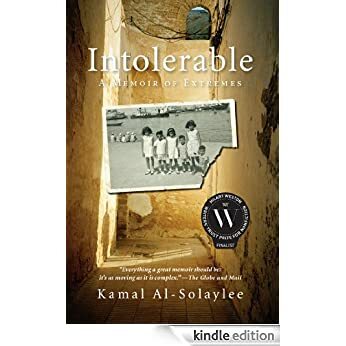 The gist of it--a memoir telling one man's story of his escape from the oppression (religious, political, anti-gay) of Yemen/Egypt to live an honest and authentic life in the UK and Canada--sounds like it should be a fascinating story. And while the facts are interesting, the story is dull and repetitive. For me, it lacked emotional connection. I trucked on through because I wanted to give this Canada Reads contender a fair shake, but my whole experience reading it (save maybe for the last chapter and who's to say for sure whether I was suddenly 'feeling it,' or just glad the whole experience was almost over) felt more like required reading than anything fun. I'm disappointed. I think that's all I'm going to say about this one. I was really excited to read this book. When I found out that Laney Liu was defending it in this year's Canada Reads competition, I grew even more excited. So when my stack of books arrived in the mail last week, I chose to read this one first. When Everything Feels Like The Movies is a YA novel starring (no, really...starring) Jude Rothesay, a teenager with nowhere to fit in or belong in his small town. Jude is gay. He likes dressing up in women's clothing. His mother is an aging stripper with low enough self-esteem to keep welcoming his abusive, addict stepfather back into their lives. His bio dad is AWOL. His best friend betrays him. Those who love him do it so secretly or in such a twisted way that it ends up being just as hurtful as hate. And he's bullied. Seriously bullied. End-up-in-the-hospital kind of bullied. But he kind of gives it right back, publicly taunting others. He distances himself from reality by imagining he's living a Hollywood life, where his "haters" are just the price he pays for fame. I wanted to love this book. Instead, I like what it's trying to do. (It's a strong kind of like. As in, I don't want to marry this book, but I would invite it to my intimate wedding.) The melodrama was a bit hard to read at times, even though I get that that's the point. Raziel Reid has created a character who is pitiable, lovable, and lothable all in one paragraph. Do you want to read it yet? You should. I'll warn you: it's graphic. But that's kind of the point, too. 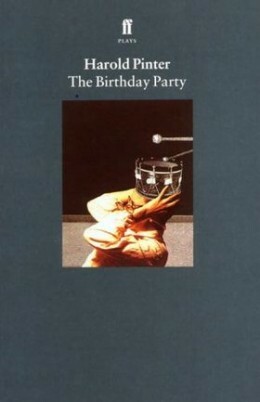 Reid is trying to get you to feel something as you read this book, and its not exactly a comfortable feeling. It's not the first time that Canada Reads has featured a YA selection. I think it was 2009 when Fruit was nominated...and that's still one of my favourites. So maybe after you read When Everything Feels Like The Movies, you could read Fruit. Read them both. And weep. Because that's kind of the point. My first surreptitious night read! Orson will stay awake and stare at the reading lamp for way too long. If it's dark, he gets all dozy and sweet so quickly. It took me a while to figure out that I can read in the dark...if I read on my iPhone. I have already raved about the amazing selection of ebooks and eaudiobooks available through the Kitchener Public Library, and the slickness of borrowing them using the KPL and Overdrive apps. So I can go on and rave about Kate DiCamillo's book instead. 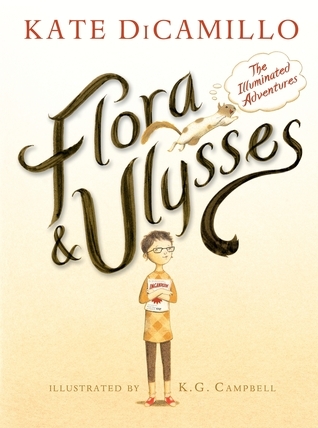 Flora & Ulysses won the Newbery Award for 2014. This honour is given for "the most distinguished contribution to American literature for children" each year. So kind of a big deal. Flora & Ulysses is classic and edgy at the same time. Classic with its nods to E.B. White (a focus on beautiful vocabulary, with definitions tucked right in to the story) and Roald Dahl (adult villains and outcast, misunderstood child heroes). Classic because it addresses issues of importance to children: divorce and unconditional parental love. Classic--and even a bit old-school--because of the absence of up-to-date technology. (The machines in this story: a fancy vacuum cleaner and a typewriter. No smartphones here.) Edgy, because it incorporates poetry and comic strips into the traditional novel form. Quirky, because narration of the story is shared between Flora Belle and a superhero squirrel named Ulysses. Up to this point, my favourite DiCamillo read was A Tale of Desperaux. I thought that would be the best read aloud ever for a class of Grade 3 students. Then it was made into a movie and I figured I would have to wait a few years before considering this book for a class read aloud because students heads would just be full of images from the film rather than their own imaginations. Now I'm thinking Flora & Ulysses is up there, too. It could be a great class read-aloud of its own--with a little bit of creative thinking on how to share the comic book pages (document camera? hmm). Worth a read. And maybe even a reread. My Canada Reads books arrived in the mail today. When it comes to fiction, mostly I stick to buying used books because the thrill is in the hunt and, well, books are expensive. 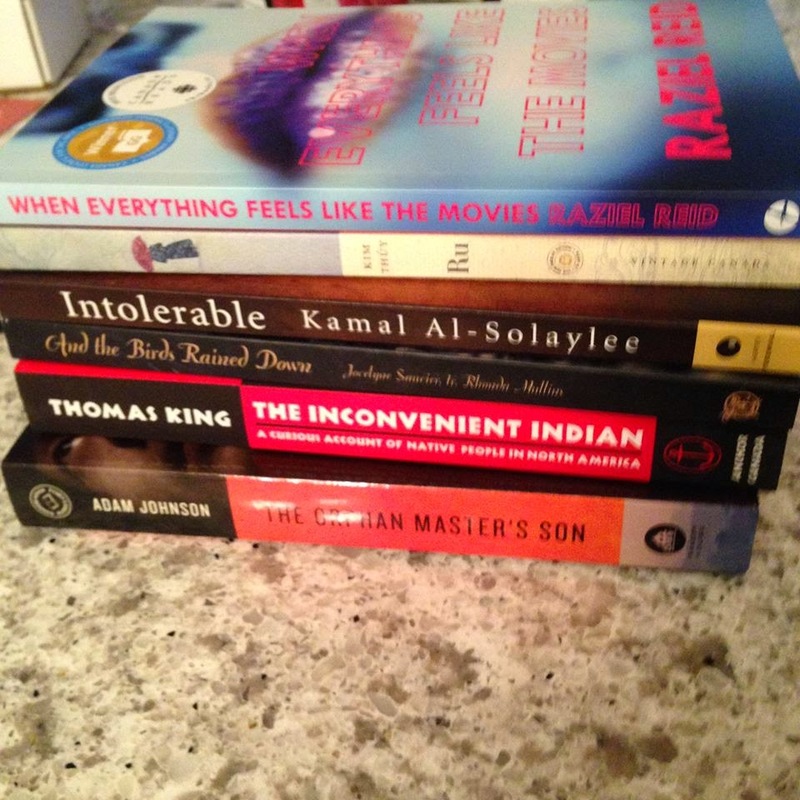 But once a year (at least) I splurge and order up the Canada Reads titles. I also ordered The Orphan Master's Son for a book club. What surprised me was how tiny the box was that everything arrived in. Has Twitter/Tumblr/Facebook reduced our love of reading and attention spans enough that novels are shrinking? Maybe, baby. So I cracked open When Everything Feels Like The Movies and was a bit scandalized by the first chapter, but more on that later. I had it in my head that I would take to reading in the rocker/recliner in baby's room while he drifts closer to dreamland. Problem. It has become apparent that reading with the lamp on in the nursery just won't do: Orson is much too fascinated with light and doesn't seem to get the hint that it's his bedtime. Which means I could spend that time on Twitter/Tumblr/Facebook or playing Trivia Crack on my iPhone, but for fear that my brain might be shrinking right alongside novel sizes, I'm resolving to use my phone to get some more reading in. I got out my KPL card and set up my phone for ebooks. (HOW and WHY did I not do this sooner? How and why? Why and how? There is so much good stuff out there!) My first download: Flora & Ulysses by Kate DiCamillo. Now that I have it all set up, I'm off to bed, but I'm sure I'll be up at some point in the night to feed baby and read at least a few pages. 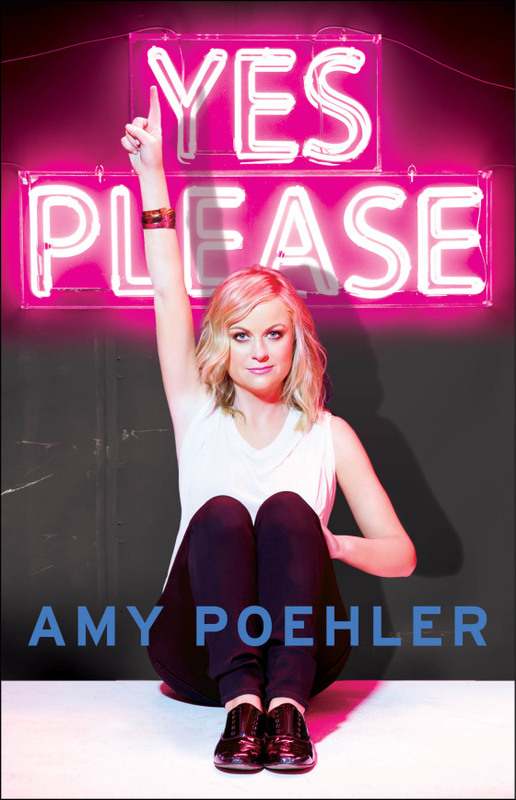 One item on my list for my "Year Of Reading Ambitiously" is "a book that takes place in your hometown." I had to stretch a little bit to find something that qualified, but I figured a book set in the earliest days of Waterloo County was close enough! Were it not my self-assigned "required reading," I may never have picked this book up, but I'm glad I did. The Trail of the Conestoga by Mabel Dunham tells the story of the migration of Mennonites from Pennsylvania to what is now Waterloo County in the early 1800s. It was the author's bio on the back cover that caught my attention. Mabel Dunham was a librarian of the KPL and started the children's section there. She was the first president of The Canadian Federation of University Women, and the particular edition of the book I bought was published to mark the 50th anniversary of the KW chapter. There was something undeniably 1940s Canadian about this novel. Beyond its musty smell, it's packed with little history lessons thinly disguised as back-and-forth banter between characters ("Why, it's Isaac Brock!" / "Who's that?") and morality tales spun so thick you trip over them. Dunham's choice to focus on the Mennonites' reasons for and history as conscientious objectors would have been an interesting and bold addition to a novel first published in 1942, right in the thick of the second World War. She consistently portrays females as strong, wise, and patient and takes a passive-aggressive approach to the issue of gender roles. (Love this gem: "...she pressed her lips together and held her peace. To begin a conversation was a privilege she usually accorded her husband, whom the good St. Paul had set up in some uninspired moment as the head of the household. She was quite satisified so long as she had the last word." This book is charming. I was thinking about recommending it as a title for my book club to consider. Unfortunately, it's not in print anymore. A quick search on amazon shows that used copies are selling for a pretty penny. (This makes me all the more proud of my $2.00 purchase from none other than the MCC's Thrift on Kent!) So I guess I'll just offer up this book on loan for anyone who wants to read it. I think librarian/author Mabel Dunham would approve. I'm several months into my maternity leave and I thought I'd have a stack of finished books piled beside the nursery rocking chair by now! While I've found some time to read, I've spent more time watching Netflix, playing games on my iPhone and continually refreshing Facebook. My goal for 2015 is to turn some of that screentime into "pagetime" and get back to the focused, productive beauty of reading good ol'fashioned books. 18. A Pulitzer Prize-winning book. 19. A book based on a true story. Until very recently, my books have been in storage. This means, rather than reading stuff I already own, I've been browsing bookshelves online and in thrift stores for something to read. 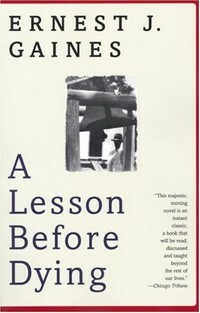 I found Ernest J. Gaines' A Lesson Before Dying for a bargain price of $2.00 at a local thrift store. The book's award winning status (National Book Critics Cirlce Aware For Fiction) and the narrator's occupation (teacher) piqued my interest. A Lesson Before Dying tells the story of a young black man sentenced to die after being in the wrong place at the wrong time and being convicted of a crime he did not commit. His lawyer's approach to get him acquitted is to portray him as a lowly animal who didn't know any better. When the lawyer's defense falls through, the boy's godmother begs the local schoolteacher to visit the boy in prison and convince him that he's more than the worthless animal the court deems him to be. 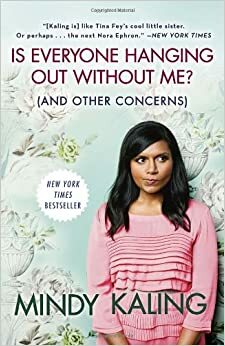 It's a bleak and depressing book (the title could have told you that), but ultimately a moving one that causes you to think about obligations to family and community, in addition to issues of race, gender and social status. If I was a high school English teacher, I would consider adding this book to my required reading list. P.S: I just found out that this book was made into a movie in 1999, starring Don Cheadle and Mekhi Pheifer. It won 2 Emmy awards. Huh. There you go. I've been reading again lately. I'm veering away from reading panic-inducing online parenting articles and back into the world of books. Real books. For lack of a better description, I'll call these books "memoirs." 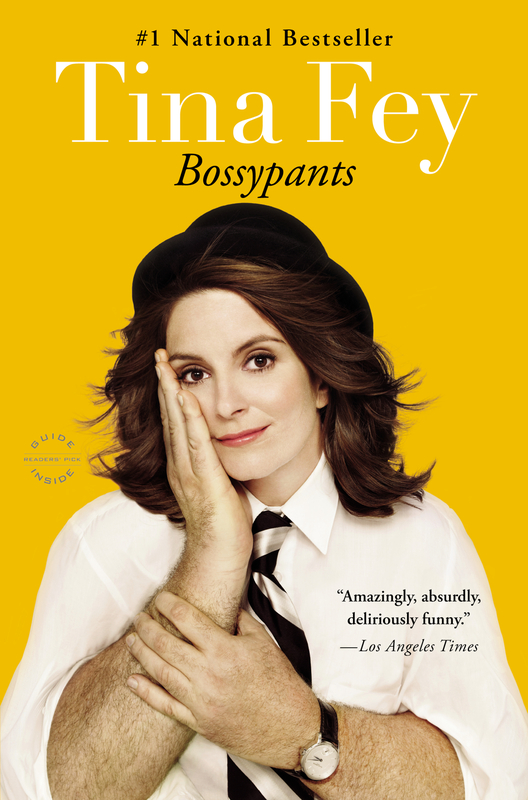 First I read Tina Fey's Bossy Pants. The best bits were about being a new mom and enduring the advice/judgement the rest of the world casts upon you. Perfect timing for me to read her snappy comebacks on the topic! b) It's non-fiction. My literary conscience tells me I need to read more of that. c) It's KW's "One Book, One Community" selection for this year and the book nerd in me needs to be a part of these kinds of things. So it turns out that Gray had every right to be critical of the books in the Canada Reads competition. She can write. Not only that, but she gives narrative to history that makes it more accessible for readers like me who are all about the story. She also gives a voice to the voiceless in this book. Subtitled, "A Maid, Her Master and the Trial That Shocked a Country," this book offers best guesses as to what really happened when Bert Massey was shot by his maid when entering his house one February evening in Toronto, 1915. Gray highlights how Carrie's (the maid's) voice was hardly needed or given consideration in a male-dominated, morally-motivated and class-driven society. Gray does an excellent job of putting Carrie Davies' story in context. She provides background on the famous Massey family, the Toronto newspaper wars, class divisions, and Canada's place in WWI, which gives the story significance not only in the changing tides of 1915, but also today. My one complaint about the book is that is the writing seems to mellow or loosen by the end. Initial chapters give the impression that the book is leading to something greater and more powerful at the end. But maybe that was intentional. I'll have to think on that a little longer.